These falls are in a forest preserve in the upper Beaver Valley, just east of Flesherton and close to Eugenia Falls. They are a smaller waterfall, wild and unspoiled by human intervention that is not as well known as some of the falls in our area, but are easy to access and in a beautiful setting. From the Boyne River they plunge over 7 meters to the river basin below, and are classified as a plunge waterfall, but there is no obvious weaker base rock, instead there is similar rock from top to bottom. You will not see any platforms, fences or signs but there are several spots to take your photographs from. William Hogg built a sawmill here during the late 1870’s and referred to the area as Little Falls in a newspaper in 1882. The mill burnt down in 1888, and only a few remnants of it remain. 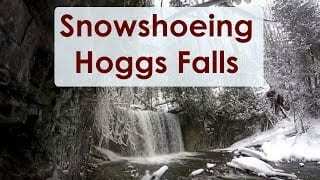 Hogg moved to Eugenia falls for his next project. Most of the area now is a forest reserve managed and protected by the Ontario Ministry of Natural resources. The river abound with speckled trout and other types of fish, so it a favorite spot for fishing in season. There are also several trails through the forest, including one to Eugenia Falls and access to the Bruce Trail for those who enjoy hiking. There is a way down to the basin but it is steep and dangerous so you may need a repel rope and it is damp and slippery at the bottom. To reach the falls from Flesherton, turn west off of Hwy.10 onto Grey Rd 4 for about 1.6 km., then left a East Back Line and right on Lower Valley Rd. Soon you will see parking on the left hand side. The falls are just a short walk through the woods, you can hear the water plunging over the rocks into the basin, and see the remains of the old sawmill. The best time to photograph the falls is in the morning or late afternoon in order to avoid harsh lighting conditions.